An upgraded in wall speaker cable for upgraded sound. 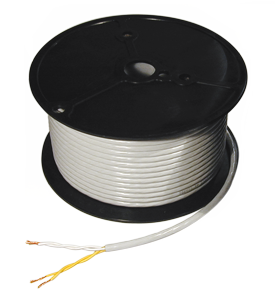 Dual gauge strand construction in PE dielectric. Four conductor design to be used in hybrid braid style two conductor termination. of 20 feet or less. One conductor of each color contains finer gauge copper strands while the other conductor of each color contains heavier gauge copper strands. to the commonly used PVC dielectric. PE provides a smoother, cleaner and more grain free sound. The off-white PVC outer jacket is durable and pulls smoothly through studs without sticking or binding. with regard to decor, should the cable become visible. convenient foot labeling makes it easier to track cable usage.